Donna Loden possesses a joyful energy and an infectious excitement that radiates to those around her. As a retired teacher, one can only imagine her in the classroom, sparking curiosity and a passion for learning among her students. Now, as the founder of Growing Healthy Waves in Tupelo, Mississippi, she is sharing her passion for building a healthy community and creating a movement along the way. When Donna taught fifth grade, something happened that stuck with her. Walking back from the cafeteria after lunch, one of the little boys in her class dropped some food that he had put in his pocket. The other students looked on, mouths agape. “Taking food out of the cafeteria was a big no-no,” Donna explains, “but I just scooped it up, put it back in his pocket, and told him we’d talk about it later.” When they did talk about it, Donna learned that the boy was trying to do what he could as a 10-year-old to help his family put food on the table. Years later, Donna made the tough decision to retire in order to care for her mother. Around the same time, the local Health Care Foundation opened up HealthWorks!, a children’s health education center and asked her to be involved. While she was primarily focused on being a caregiver for her mother, she started working on a part-time basis and began merging her two passions – better health and education for children. While working at the children’s health education center, Donna learned that a neighboring town, Oxford, was registered as a FoodCorps service site. 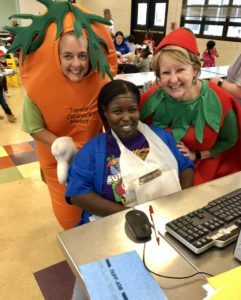 After observing how the organization works to connect kids to healthy food in school, Donna knew that Tupelo needed to become a service site. “I started to lobby for it, with phone calls, emails, and more” Donna relates. Tupelo is the birthplace of Elvis Presley, and each June the city plays host to Elvis tribute artists. The streets downtown are lined with steel guitars painted by schoolchildren that lead to the famous birthplace.“I started sending them pictures, saying ‘Elvis is in Tupelo, FoodCorps needs to be in Tupelo!’ and eventually I guess I wore them down!” She laughs. 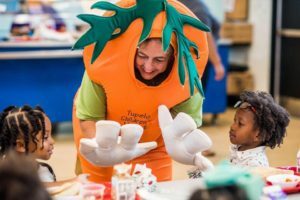 FoodCorps representatives came to the city and fell in love. With FoodCorps on board, Growing Healthy Waves was born. FoodCorps service members are placed in yearlong programs with a service site, and they are truly the boots on the ground. Donna focuses on grant writing and building partnerships, and used her connections at area schools to get buy-in for the program from the central office of the school district. One component of the nutrition problem that Donna identified was a disconnect between food and food sources. “Kids literally didn’t understand a connection between planting seeds in soil, sunlight, and the foods they were eating,” Donna states. 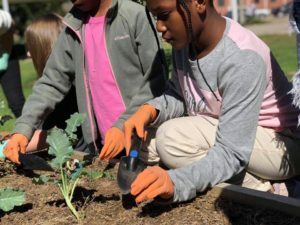 To help them make that connection, she secured funding for a greenhouse where kids have STEM classes and plant seeds. She also trained teachers on ways to incorporate state-mandated education standards into an exciting outdoor setting. 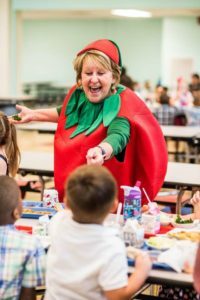 Through a donation from the Whole Kids Foundation, Donna had two salad bars installed in elementary schools, allowing kids to see the veggies they’re growing in action. In addition to the greenhouse produce, the school nutrition director has done a wonderful job sourcing local produce from area farms, giving kids the opportunity to taste fresh, nutritious peppers, tomatoes, kale, sweet potatoes, turnips, and more. This sense of community coming together to accomplish a common goal is at the heart of Donna’s work with Growing Healthy Waves. “I’ll be the first to tell anyone,” she remarks, “I’m not a great gardener. I’m not a great cook. But I’m good at bringing people together to make a difference. We all use the talents that we have!” The way that Donna has built connections to support healthy kids is truly inspirational. She is a volunteer, and is not paid for any of her efforts, but works tirelessly to spread the message throughout her community and make space for others to get involved, whatever their talents may be. She works with local farmers, local chefs, area businesses, foundations, state and local universities, government organizations, and more. In doing so, she’s transformed her project into a community legacy with deep roots in all aspects of life. While Donna recognizes that the little moments (kids and parents touching worms for the first time, students going wild over crazy looking root vegetables, etc.) mean just as much as the big achievements, there’s one day that really stands out. 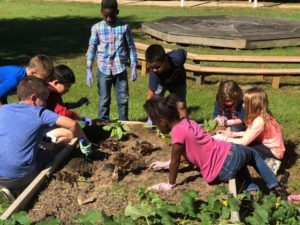 Three years ago, a school in the district was chosen as a spotlight school for Mississippi’s Farm to School Week. A teacher had written a grant for a school garden and needed help getting the beds planted. With Donna’s support, the community rallied. The local baseball team came to help, farmers came to the school to teach about fresh foods, the children sang a song, community officials were present, and the program received seed funding from Toyota through a partnership with a nearby manufacturing plant. It was a beautiful day, and a beautiful display of what can happen when people come together with a common goal, unified in their shared excitement. We can’t wait to see how Donna’s passion continues to shape her community. To stay in the loop with Growing Healthy Waves, follow them on social media. 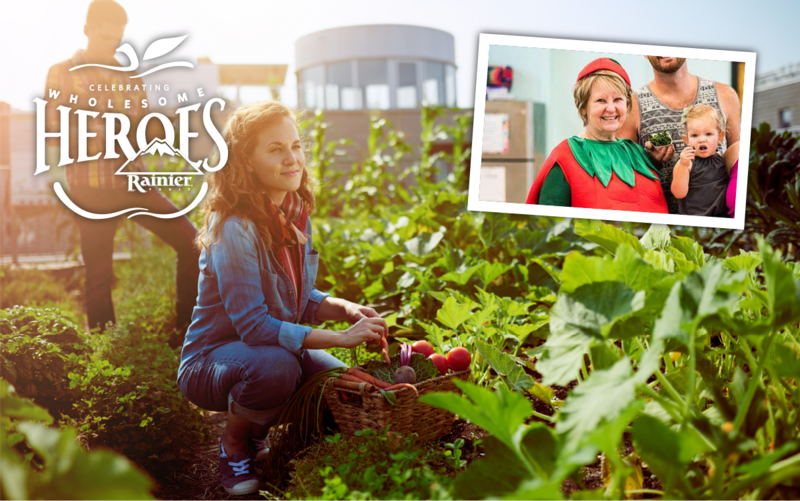 Rainier Fruit, along with our partners at the Whole Kids Foundation, are truly honored to call Donna Loden a Wholesome Hero.